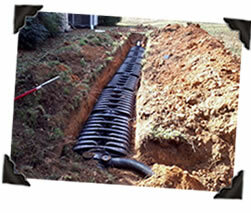 We at Phil Crews Septic specialize in septic system installation and septic system repairs. Due to our knowledge of local town and state regulations and our close working relationship with many of the area's finest engineers, we are able to help you through the entire process, from acquiring the necessary permits to cost effective repair and installation of a complete new system. 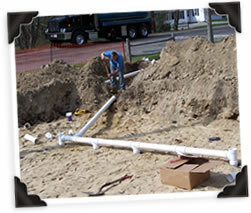 Your new septic system will be installed in accordance with Title V and local approving authorities. All components will be of the best quality, passing or surpassing both the Alabama Department of Environmental Protection's specifications and the design engineer's specifications. Once the installation is complete, the disturbed area will be re-graded, spread with screened loam, raked and hydroseeded, leaving the job complete and virtually hassle free. Many of our customers are actually happier with their finished yards than they were before we arrived. We will gladly provide you with references from some of our many satisfied customers in your area. We take great pride in our work, always having in mind that our job site is your property. Throughout projects, we maintain a neat and safe work place. Remember that a septic tank system cannot be safely installed on all lots or building sites. Some lots or building sites are unsuitable because of the type of soil, terrain (too steep, too low or wet, etc. ), size, ground water, rock, or other factors which would interfere with operation of the system. Although one usually wants to keep all the trees and shrubs possible on his lot, remember that the roots of trees and shrubs growing near the septic tank system may infiltrate the absorption trenches and block the flow of sewage. It is advisable to remove trees and shrubs growing over the trenches or near the septic tank system.